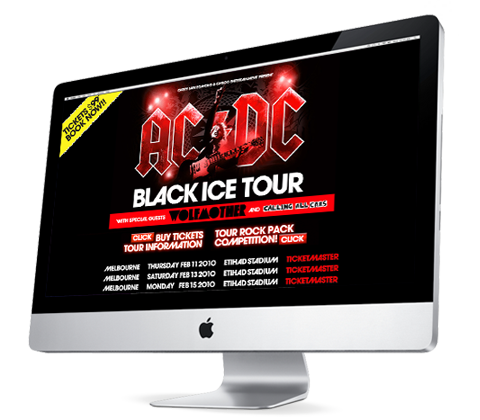 Our Digital Agency was engaged as the official digital agency to enhance the Australian and New Zealand “Black Ice Tour” for AC/DC. This including supporting the ATL worldwide campaign and Garry Van Egmond Group across a wide range of media. AndMine also created a unique ‘multi-platform’ social networking competition across Twitter, Facebook, Foursquare, YouTube, websites and blogs to capitalise on the campaign momentum using new viral optimisation techniques, for example; the moderator profile ‘Judge Rock’ on Facebook. Go on, see if you can challenge us on "Social Media Ecosystem" - Part of our 159 services at &Mine. We are quick to respond but if you want to go direct, test us during office hours.